ST. LOUIS — Brooks Koepka has won his first PGA Championship, playing poised and mistake-free golf down the stretch amid ear-splitting roars for Tiger Woods and a late charge from revitalized Adam Scott. Koepka is the fifth player to win the U.S. Open and PGA in the same year making him a three-time major champion. “For some reason the Majors gets my attention, every shot is so important,” Koepka told CBS after receiving the Wanamaker Trophy. He also thanked the fans who came out and cheered loudly. The U.S. Open champion closed with a 4-under 66 to reach 16 under for the tournament. That left Koepka three shots clear of Scott and two ahead of Woods, whose Sunday charge electrified the packed grounds of Bellerive Country Club as if it was a decade ago. Woods capped a 6-under 64 with a long birdie putt at the 18th, pumping his fist as if he had won. It was the four-time PGA champion’s lowest final round in a major. 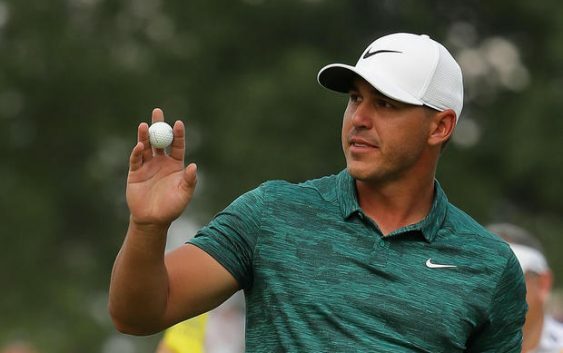 The unstoppable Koepka joins Woods, Jack Nicklaus, Ben Hogan and Gene Sarazen as those who have both won the U.S. Open and PGA in the same year. Brooks Koepka of the United States celebrates after making a par on the 18th green to win the 2018 PGA Championship with a score of -16. CBSSports.com points out that when Koepka is compared to Dustin Johnson, currently the World No. 1 player, there is a tendency to favor Johnson and his 19 career wins. But Koepka has three times the number of major wins as his gym pal, and now with a PGA Championship win, his own case as one of the best golfers in the world. With roars for Woods unheard anywhere this side of Augusta National, Koepka kept his cool and ran off two birdies on the back nine at Bellerive right after Woods closed within one shot. Tiger Woods of the United States plays a shot on the 17th hole during the final round of the 2018 PGA Championship. Scott hung around by making big putts, just like he hoped, and was tied for the lead until Koepka’s birdies. They both missed 6-foot birdies on the 17th, and Scott had to settle for third when he bogeyed the final hole for a 67. CBS Sports captured a touching moment as Koepka and his mother shared a hug after his victory.